Credit: ETH Zurich / Simon Kuster et al. This animal has done everything right. It has been around for 300 million years, outlived the dinosaurs and survived the catastrophic meteorite impact, warm phases and glacial periods. Even today, it continues to populate the sea at depths where it eats carrion and hunts prey. The Atlantic hagfish (Myxine glutinosa) is not really attractive at first glance. In fact, most people probably consider it quite disgusting. Nevertheless, the hagfish – or rather its slime – has caught the attention of a group of ETH researchers at the Laboratory of Food Process Engineering of Professor Erich Windhab. The slime of the hagfish is an extraordinary defense mechanism. When a hagfish is attacked by a predator, it secretes a glandular exudate that gels within a split second and forms a massive slime mass – even in cold water. This slime immobilizes vast amounts of water, forming a dilute, viscous and cohesive network. Fish attempting to attack the hagfish may then suffocate on the slime and thus let go of the hagfish. 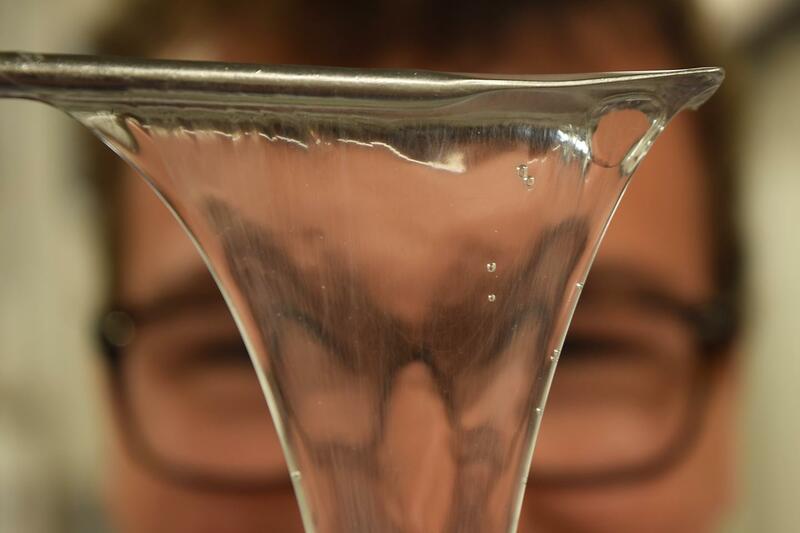 This slime is now the focus of a three-year ETH research project supervised by Dr Simon Kuster and conducted by doctoral student Lukas Böni, Master's student Lukas Böcker, and postdoctoral researcher Patrick Rühs from Professor Peter Fischer's research group. The slimy sea dweller piqued Kuster's interest two years ago when he saw a BBC documentary about the hagfish, a creature that immediately fascinated him. "As a chemist and material scientist, I couldn't help but wonder what this slime consists of and what factors allow it to immobilize such enormous amounts of water," says Kuster. Preliminary research quickly revealed to the scientists that there had been little examination of the structure of the slime and how it is formed and secreted. The scientific community knows that the natural hydrogel produced by the hagfish has two main components: 15- to 30-cm-long protein threads and mucin, which sits between the threads and makes the slime "slimy". The protein threads have properties similar to spider silk. According to Kuster, the threads are extremely tear-resistant and elastic, though only when moist. The components are produced in special ventral glands. Two types of cells are embedded within the gland, producing either the filamentous protein or mucin. When in danger, the hagfish secretes these cells intermittently through its pores. Thereby, the cell envelopes rupture, releasing the two components (threads and mucins). They immediately interact with the seawater and form a matrix that "absorbs" and immobilizes the water. The slime consists of almost 100 % water and contains just 0.004 % gelling agent. In other words, the weight ratio of gelling agent to water is 26,000-fold, which is over 200 times more than in conventional animal gelatine. Furthermore, very little energy is required for the gelling process. The ETH researchers were especially fascinated by the fact that the protein filaments have the form of a sphere measuring 150 micrometres in diameter while still in the glands, but once they are part of the slime they extend to threads of several centimetres in length. How the threads unwind from the sphere is not yet understood in depth. "The way the threads coil within the cells is highly specialised and very unusual," says Böni. The ETH researchers travelled to Norway several times in preparation for their project. Following a long search, they found a project partner in Ålesund (N), which was authorised to catch Atlantic hagfish in the wild and keep them in an aquarium. "Before we partnered with the Aquarium, we carried out initial pre-trials on the slime in a garage equipped with basic laboratory infrastructure we brought to Norway," says Prof. Fischer. Transporting the animals to Zurich would facilitate the research, but would not a be good idea. "The transport would stress the hagfish too much. They would secrete slime throughout the journey and eventually suffocate in their own slime," says Böcker. The laboratory in Zurich is also not set up to provide a species-appropriate habitat: constantly fresh seawater at 10°C in a dark room. The project aims to mimic the hagfish gel in order to create novel "super hydrogels". Before this, however, the researchers first need to unlock the secret of the slime formation and its huge capacity to absorb water. Thanks to their preliminary analysis, the ETH researchers have found a way to stabilise the glandular secretion so that it can be transported to the laboratory in Zurich for further studies. However, the factors allowing this stabilisation are not yet known. If the researchers solve this puzzle, it might be possible to apply a similar stabilisation method to a biomimetic imitation product – one of the long-term goals of the project. According to Böni, an exact functional imitation of the glandular secretion is unrealistic: "We cannot copy the slime formation mechanism of the hagfish in the laboratory. This natural system is far too complex," says the ETH doctoral candidate. However, developing a gel that follows the principle of the natural slime, on the other hand, seems possible, he says. Hydrogels have found many applications nowadays – from disposable nappies to adhesive plasters to irrigation systems for farming. They are widely used in the food industry as well. Other researchers that previously examined the slime of this primeval fish proposed that the fibres could be used to make textiles. The ETH researchers are not yet able to gauge whether the project, categorised as high risk and financed by an ETH research grant, will lead to a practical application soon. However, they have already been able to show how the short-lived slime – which collapses under mechanical stress – can be stabilized and functionalized by incorporating other hydrogels or particle networks.